On behalf of NanoDiode, Studio HB started a series of interviews with scientists, engineers, futurists, ethicists, consumers, policy-makers and artists around Europe about nanotechnology research and its ethical, legal, safety and societal dimensions. So far an inspiring variety of 21 interviews have been uploaded onto the NanoDiode YouTube channel. 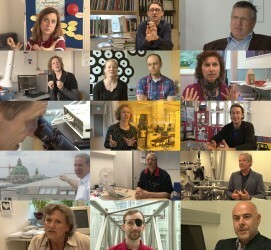 In these 90 seconds video clips, all sorts of nanotechnology-related experts from all over Europe discuss their challenges, expectations, worries and hopes related to their work in the field of nanotechnologies. If you have any questions about nanotechnology-related issues, please send us an email and we’ll find the right scientist, engineer, futurist, ethicist, consumer, policy-maker and/or artist in Europe to answer it! By filling in the contact form you can also be a part of this public event!